It's a darling typewriter too! I wish I had kept the old one that my mother in law had. Would be fun to see children's reactions to it! This pic is very glamorous! Wow! That would be nice! What a pretty amazing shot! Love it. g l a m o r o u s! I love this old type writers! Like the beautiful bling blings it is an eye catcher! That's exactly how I look while typing this:) in my dreams;) it is so lovely! Nice shot!!! Glamorous is right. 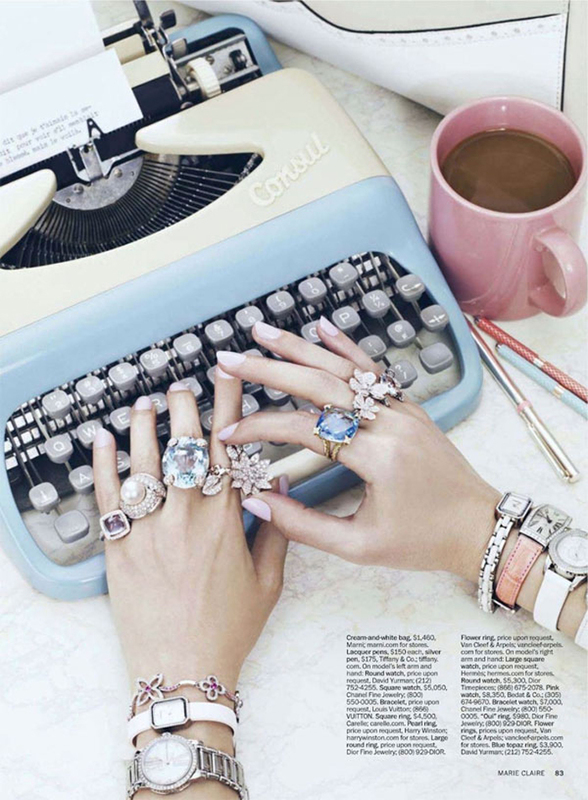 Very glamurous, not only the rings and watches , but the nails and the typewriter. I agree, wish I looked that glamorous when I worked away too! Sadly its more like a cup of tea and wearing some PJ's!!! Have a great weekend Kellie! Yes that 's a great shot - love all the decadence!